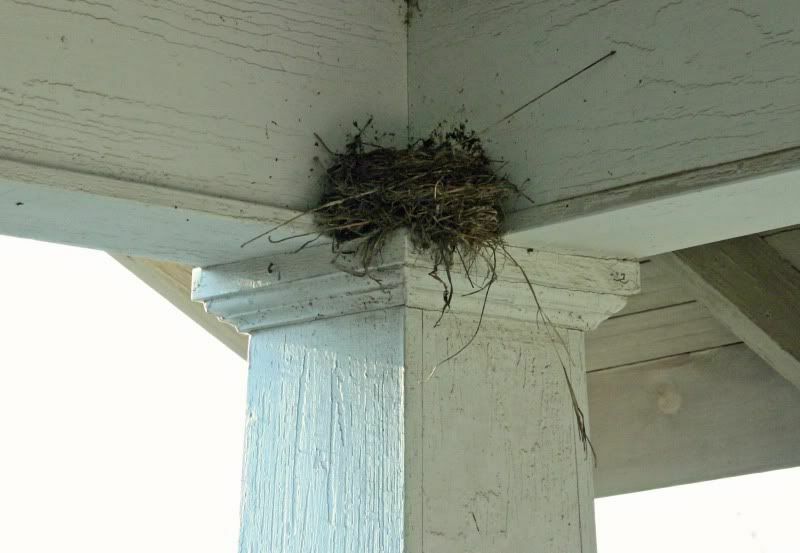 This week we had a bird build a nest on our porch. It's so sweet to look through the window and see the mom my bird sitting there. And it's been a great lesson for the kids to see just how precise the bird is with every detail of making her nest. They can see how the nest making skills didn't just "happen" but are obviously something God gave birds! The Girl said, "I couldn't take a stack of twigs and make them into a nest. They just be a pile and then fall apart." What a wonderful fingerprint..What a fun thing to watch. Birds are so much fun to see and always happy when they return here. Beautiful picture. What a beautiful lesson for your kids! Isn't it amazing how God shows Himself in everyday things like nature? How wonderful. I love birds, they sing you songs and are so cheery. It makes me feel special that they choose to live close by. I love to sit and watch the Robins build their nest together each spring! From sun up till sun down they work so hard, it shows so much devotion to their mate and up coming birds. Great Fingerprint post! We used to have doves that would make their nest in a very sad spot. The eggs always fell and it was a poor lesson for my kids, but they were fascinated by the nest! Love this! Thanks for letting me be a part! Very cool! And to think some people would hate that and try to get rid of the nest! Wonderful fingerprint. It is amazing to watch the birds nests coming together. I love watching the inside of nests from the eggs to the baby birds. Love, love the picture! It's a beauty of a nest! What a great lesson to teach your children that not only does it take skill to build the nest,but also that someone has to take care of it! And it's hard work! I can't wait for the baby birds to arrive! Neat!!! My daugther was just asking about bird's nests the other day and how they made them. They are a wonder! That's a big nest! How fun. Sorry I didn't participate today but I will link to the other blogs. I'm thankful that I have weeds to pull this afternoon. Okay, that might be a stretch but I'm glad I have help! That's fantastic! Love your daughter's comment :) We had this happen on our porch a couple of years ago - what amazed me even more was how fast the babies grew & flew away!! sorry about the bad links. we are visiting my son and I'm having trouble using his laptop. what a beautiful post beki. i love the birds nest. i could sit and watch birds for hours.